23 years later, Richard Russo returns to North Bath to tell more of the story of the charismatic Sully, who is now facing a major health crisis along with his usual family problems. Also along for the ride is Raymer, the beleaguered and hapless police chief, still reeling from his wife's sudden death‎. Everybody's Fool is full of memorable characters, and is entertaining, funny, scary and surprisingly emotional at times. One of the best books of the year. An immediate national best seller and instant classic from the Pulitzer Prize-winning author of Empire Falls. Richard Russo returns to North Bath—“a town where dishonesty abounds, everyone misapprehends everyone else and half the citizens are half-crazy” (The New York Times)—and the characters who made Nobody’s Fool a beloved choice of book clubs everywhere. 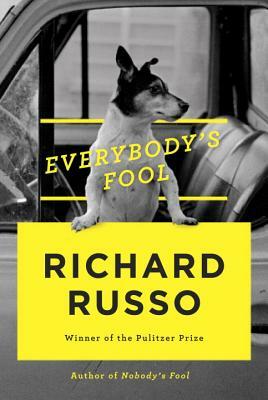 Everybody’s Fool is classic Russo, filled with humor, heart, hard times, and people you can’t help but love, possibly because their various faults make them so human. Everybody’s Fool picks up roughly a decade since we were last with Miss Beryl and Sully on New Year's Eve 1984. The irresistible Sully, who in the intervening years has come by some unexpected good fortune, is staring down a VA cardiologist’s estimate that he has only a year or two left, and it’s hard work trying to keep this news from the most important people in his life: Ruth, the married woman he carried on with for years . . . the ultra-hapless Rub Squeers, who worries that he and Sully aren’t still best friends . . . Sully’s son and grandson, for whom he was mostly an absentee figure (and now a regretful one). We also enjoy the company of Doug Raymer, the chief of police who’s obsessing primarily over the identity of the man his wife might’ve been about to run off with, before dying in a freak accident . . . Bath’s mayor, the former academic Gus Moynihan, whose wife problems are, if anything, even more pressing . . . and then there’s Carl Roebuck, whose lifelong run of failing upward might now come to ruin. And finally, there’s Charice Bond—a light at the end of the tunnel that is Chief Raymer’s office—as well as her brother, Jerome, who might well be the train barreling into the station. A crowning achievement—“like hopping on the last empty barstool surrounded by old friends” (Entertainment Weekly)—from one of the greatest storytellers of our time.